Fires or explosions in NYC apartment buildings are extremely dangerous and scary and can be caused by many different things, including negligence, faulty gas line installation, defective gas meters and smoke alarms, and more. When it comes to apartment fires, burns, smoke inhalation, other serious injuries and even deaths can occur, as well as damage your home and belongings. If you or a loved one has been injured or died in a gas explosion or fire in your apartment building, you need an experienced NYC fire and explosion attorney who can help guide you through investigation, litigation, and insurance companies. In some cases, it can be the landlord, super, or property manager who is at fault for the fire or explosion. In these instances, it often comes out that shortcuts were taken either in the building process, through irregular or improper maintenance, or not maintaining the maintenance schedule. Failing to comply with federal, state, and city building and fire codes. Failing to maintain or replace faulty smoke detectors, sprinkler systems, fire extinguishers, and any other fire prevention systems or equipment. Failing to repair or replace faulty, defective, or damaged electrical wiring, gas lines, appliances, flammable building materials, or any other potential source of fires. Sometimes the negligence is not the fault of building managers and landlords, but can be due to third-party people, such as the manufacturer of a defective or faulty smoke or fire detector or the contractor who was responsible for building and constructing the apartment building, the gas or propane company responsible for the gas or propane in the case of an explosion, or the electrician who installed the faulty or damaged wiring. In almost all fire and explosion cases, your personal injury attorney needs to be able to prove that the fire or explosion was caused by someone’s negligence. In the law, negligence is defined as “failure to use reasonable care, resulting in damage or injury to another.” This means that if the property managers or landlords fail to maintain the apartment building the the way they are legally required to, then that is negligent. One major case currently in the news is the 5-alarm Bronx fire on Thursday, December 28, 2017, which killed 13 people, including four children, and injured many more. The fire occurred in an apartment building on Prospect Avenue in Belmont and was started by a 3-year-old toddler playing with a stove burner. 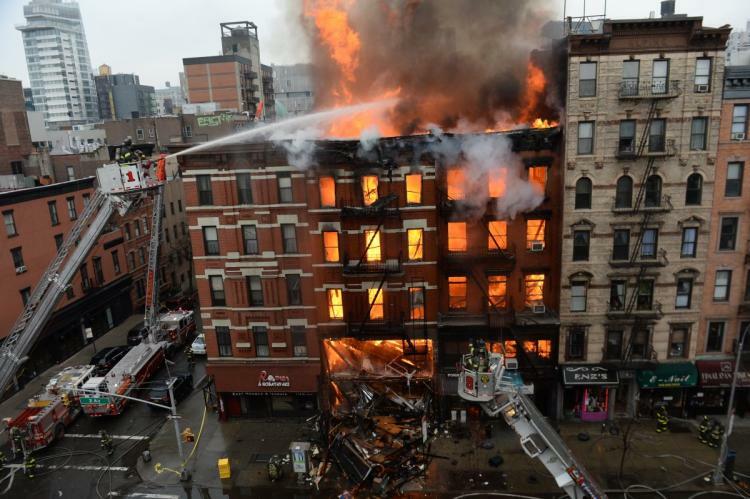 Robert Vilensky, one of the named partners at Ronemus & Vilensky LLP in New York City, is representing a group of claimants who represent the four deceased members of the Stewart family, right of the injured people, and one person who escaped the blaze. The group is planning to sue the Fire Department of New York (FDNY), the city Housing Preservation and Development department, and the Administration for Child Services (ACS) department for negligence. In addition, neighbors, as well as Vilensky’s clients, declare that they have seen ACS agents visiting the fire-starting child’s apartment and that the mother was known to authorities. They claim that had the child been removed from a neglectful situation, this fire would never have occurred. No matter the location, fires and explosions are scary and dangerous, but in New York City, there is significant chance of fires spreading and affecting surrounding buildings, of old pre-war buildings having faulty or defective wiring, failing smoke detectors, and of innocent bystanders being hurt. In New York City, fires and explosions are among the most devastating events. Why Do Gas Explosions in New York Occur? New York City’s gas distribution system is one of the oldest distribution systems in the United States. We have 6,302 miles of pipes transporting natural gas underneath our city, made up of mostly old and corroded pipes, with rampant leaks, including the one which caused a gas explosion that destroyed two buildings in East Harlem in March 2014. Federal records show there are thousands of leaks in these pipes every year, leading to fires and explosions across NYC. Nearly half of the gas mains operated by the two major gas companies in New York City, NationalGrid and Consolidated Edison, were installed prior to 1940, and more tha half of the mains are made of cast iron, wrought iron, or unprotected steel, all of which are vulnerable to cracks and corrosion. Replacing all of them is a very lengthy and costly prospect. ConEd estimates it would cost them approximately $10 billion to replace the old mains in their network alone. When it comes to fires and gas explosions, our experienced New York City personal injury lawyers are compassionate and able to conduct in-depth investigations to help you get the justice and compensation you deserve. Recently, Ronemus & Vilensky fought fought their client, a 50-year-old woman, was cooking rice on her stove while wearing a robe. The sleeve of her garment caught fire, and due to the material and poor design of the robe, a “chimney effect” occurred, where the fire went up the material too quickly. Our client immediately got in the shower, but ended up being burned on over 80% of her body. She was placed into a medical coma and unfortunately died a month later. We took on her case on behalf of loved ones and settled it for $2,500,000 in our favor. Another burn case happened when our client, a 2-year-old child, was in a bedroom of her grandmother’s apartment in Yonkers, NY. She screamed and her hands were red. The next day, the child’s hands were blistered and her mother took her to the hospital, where she was admitted for five days and treated for second- and third-degree burns, as well as having to endure a skin debridement. It turned out this was all a result of an uncovered radiator, and we won $55,000 for our client for medical bills and pain and suffering. If you or a loved one has experienced suffering, pain, or injuries due to fires or explosions in New York City, contact a lawyer immediately. We will help you get through this difficult time and receive the justice you deserve.